The story of milk is the story about life. strengthens us and helps us grow throughout the years. It can be fresh, it can be soured. dairy products with wonderful flavours. Your reliable partner for over 70 years ! At the international AGRA fair, our products traditionally receive the highest recognitions. In 2018, we have received the Grand Gold Medal for the buttermilk elderflower and lemon flavour, buttermilk pineapple flavour, chocolate milk, whipping cream, skimmed milk powder and slovenian cultured butter. 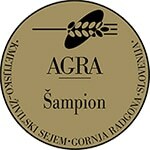 Our Ljutomer cultured butter, emmentaler cheese, milk powder and buttermilk strawberry flavour received the title Champion for receiving the highest appraisals three times in a row. Once again we have proved that our main value are high-quality products, because we believe that our customer deserve only the best. Pomurske mlekarne is a company with a respectful tradition, a successful present and a strong vision for the future. Ever since the company Pomurske mlekarne was established in 1945, we have been well aware that milk is one of the most delicious nature’s treasures, which is why we handle it with care and respect.